In the gold medal match, Shields once again showed her hand speed, power, grit, and winning championship determination and demeanor. Whether you come at her or try to box, she is going to find a way to nail you some good ones. Her head movement was solid too. She just seems to have that attitude that she is there to win clearly and to hit and hurt you. She was the most amazing talent that I saw in the Olympic Trials, and she once again proved it in the Olympics. Her victories were the most clear in the entire tournament, forany woman. 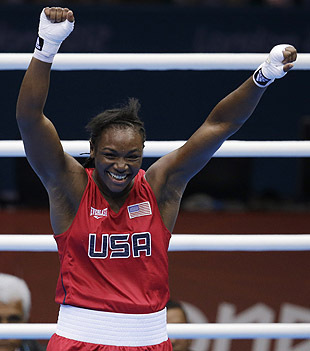 And Shields was the only gold medalist boxer for the U.S. Kudos to Marlen Esparza for bringing home bronze as well. She has nothing to be ashamed of. She fought well and lost close to a spoiler. Esparza and Shields were the only boxing medalists for the U.S. I and others have been saying all along that women boxers need to be respected more in the U.S., and afforded better treatment, and not dismissed as second class citizens. Hopefully these medals will go a long way towards justifying that, and changing some hearts and minds.